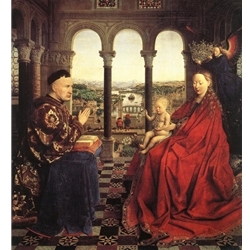 Selected Size: 24" X 36"
Jan van Eyck, the most famous and innovative Flemish painter of the 15th century, is thought to have come from the village of Maaseyck in Limbourg. No record of his birthdate survives, but it is believed to have been about 1390; his career, Documents show that in 1432-33 van Eyck bought a house in Bruges. He signed and dated a number of paintings between 1432 and 1439, all of which are painted in oil and varnished. According to documents, he was buried on July 9, 1441.